By The Numbers: Does Orrville belong in the Ohio Cardinal Conference? With the release last week of the new OHSAA enrollment numbers, the discussion has come up again as to whether we belong in the Ohio Cardinal Conference...and by numbers alone, we simply don't. But is there more to it than that? I'm not so sure, but in the following post, I'll lay out the numbers and try to let that make my point for me. If you don't want to read the stats, I'll save you the time, I think it's time for us to get out of the OCC....and I have one solution that I think would work. But you'll have to read the whole post to get to that part. Come on....you know you want to. Was out of town last week and have had a real busy past six weeks...time to get caught up. Read below for a wrap up of the spring sports season, changes to the OHSAA football structure, the final OCC All-Sports standings, and more! 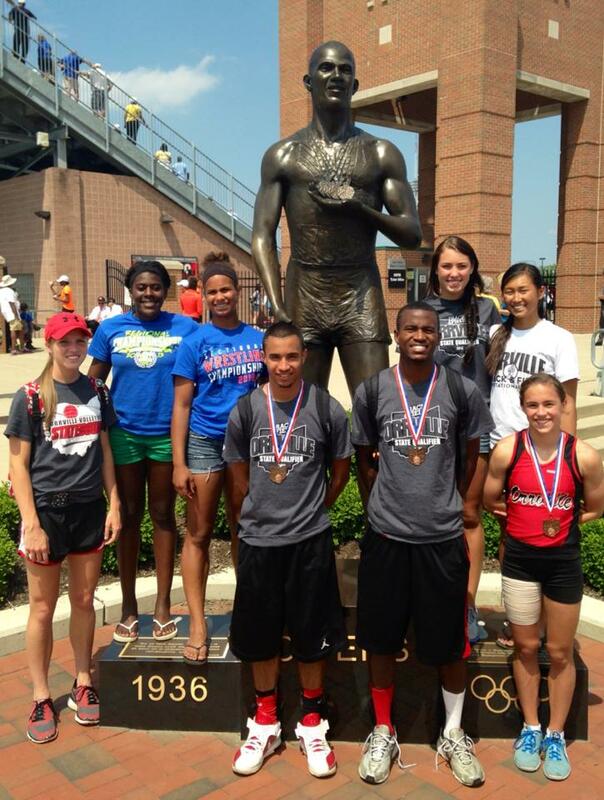 A big congrats to the 3 Red Rider track athletes who finished "on the podium" at the state track meet last weekend. Freshman Jessica Eby surprised the entire area by finishing 5th in the 300m Hurdles, Senior Tyrone White finished 7th in the 800m run and junior Elijah Coleman finished 3rd in the 400m run. All 3 earned All-Ohio honors by finishing in the top 8. While all of the Orrville runners put up excellent times at state, none of the 3 were able to break school records in the process....and that says so much about how high the bar is at Orrville when it comes to track. 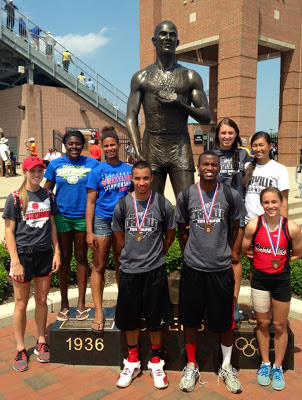 Putting 3 kids on the podium in one weekend would be a tremendous achievement at any other school in the area, but it's sort of ho-hum at Orrville, where track success is simply expected. The baseball team fell short of their first trip to Columbus since 1976 when they fell to Youngstown Ursuline in the regional final by a 4-1 score. Record-wise, it wasn't the most impressive year, but the OCC schedule was again a meat grinder and prepared the Riders well for tournament play, capturing a 2nd straight district title and advancing one game farther than last year. Ever since the state announced they would add a 7th division in football a year ago, it was anticipated that Orrville would drop to division 5...and last week it was made official as Orrville has been officially placed in Division 5 with 185 boys in grades 9, 10 & 11. Looking back at my own site, I see we were at 211 boys when the count was done in 2008 and 214 boys in 2011. A drop in 2013 to 185 means we've dropped about 15% in enrollment in just the last 2 years. The girls numbers are down as well, from 182 in 2008 to 174 now, but not as dramatically. If the state still had the 6 division alignment for football, the Red Riders would still be in Division 4, but just barely. The cutoff for division 4 in 2011 was 177 boys, meaning we'd be one of the smallest Division 4 schools in the state. We're joined in division 5 by county schools (Northwestern, Norwayne, Chippewa, Waynedale) and other locals Canton CC, Tuslaw, Fairless & Loudonville. We will be playing for 1 of 8 playoff spots in the Northwest region and the 5 Wayne County teams will be the easternmost teams in the region. Any playoff appearance by any of the 5 will likely result in some longer trips to playoff games. With the addition of a 7th division, it will also mean that the state championship weekend in Massillon & Canton will have an extra game on Thursday night in addition to the 3 games on Friday & 3 on Saturday. This year will also be the last for the games to be in Massillon/Canton. Starting in 2014, games will be played at Ohio Stadium. Massillon high school's orange and black football squad ran rough shod over Orrville high Saturday afternoon at Orrville, smothering the Wayne county warriors under a 63 to 0 score. It was just as advertised, a practice game for Coach Snavely's gridders. The game enabled the local tutor to get a line on the ability of the men seeking varsity positions. The season opens next Saturday with Uhrichsville here. I just love the way newspapers used to write. Anyway, I'm 100% certain that the game from 1915 was a scrimmage, and therefore should not count in our all-time win total. Lexington won another OCC All-Sports title in 2012-13, their 9th straight in 10 years the league has given the award. Orrville finished 6th. I'm not sure we've ever finished in the top 4 of the all-sports points. It's just amazing to me that we've been in the OCC for a decade now, and have very few conference titles to our name. Other than a shared football title in 2005, boys sports have ZERO OCC titles. Girls sports have fared a little better, boasting 3 in basketball, 3 in volleyball, 1 in softball and 2 in track....9 total. That's 10 total OCC titles in 10 years in the league...or an OCC title in 1 sport per year on average. To compare, Lexington won SEVEN OCC titles in this past school year alone. I know the OCC prepares us for post-season play, but too many of our sports have no chance to ever compete for an OCC title. The conference is simply too big for us. We could double our enrollment and still not be in the top half of the league in terms of size.